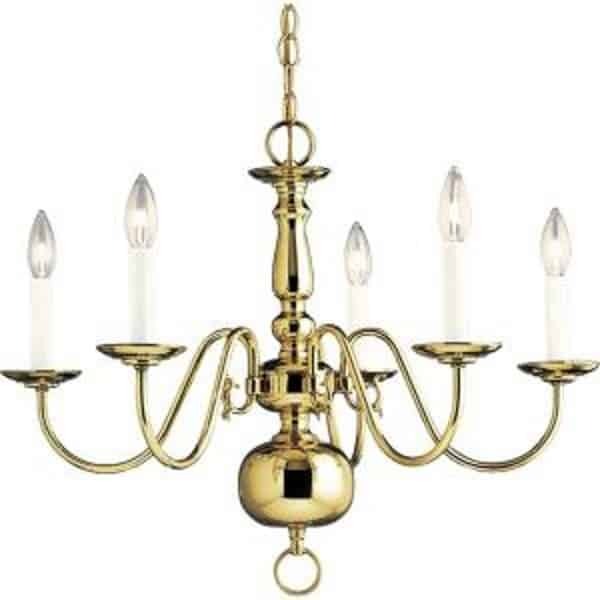 Do you live in one of those houses that has the basic factory made brass chandelier hanging in your dining room? Not that there’s anything wrong with that type of chandelier. It’s actually a nice style and suits most decor. However, after giving birth to my son over 7 years ago and going from working full-time to becoming a stay-at-home mom, I needed some excitement in my life. I was never the creative type and was intimidated by DIY (Do It Yourself) projects around the house. But I kinda wanted to prove to myself that I could do whatever I had set my mind to do. After all, I just gave birth to my son at almost 39 years old. If I could do that, I could do anything. I kept looking at the chandelier wondering what I could do with it to make it look more shabby chic, which was the style I wanted in my home. So I went to Michaels looking for some inspiration. Some links in post are Amazon affiliate links. 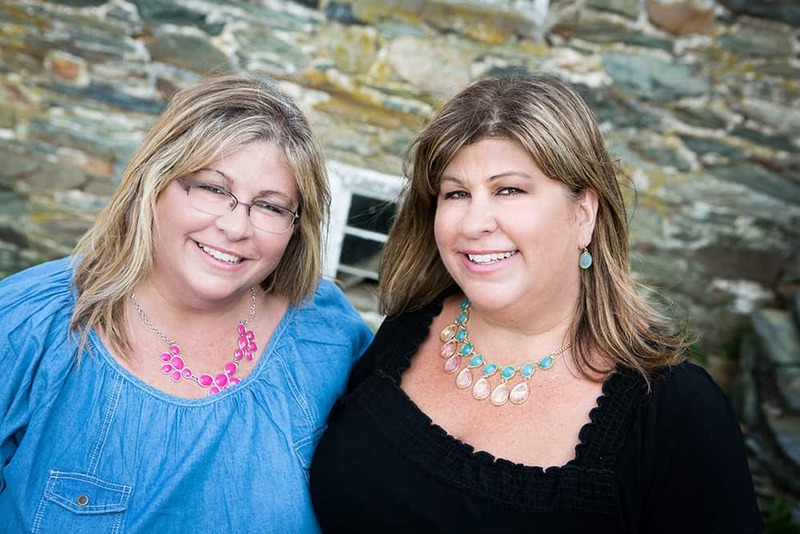 If you click on them & make a purchase, I will receive a very small percentage – like a few cents. However, this does not affect the price you pay or my opinion about these items. 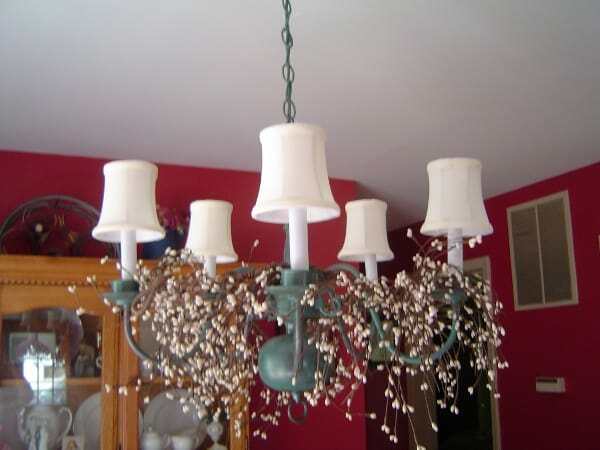 I found exactly what I was looking for – a kit to ‘patina’ my chandelier. 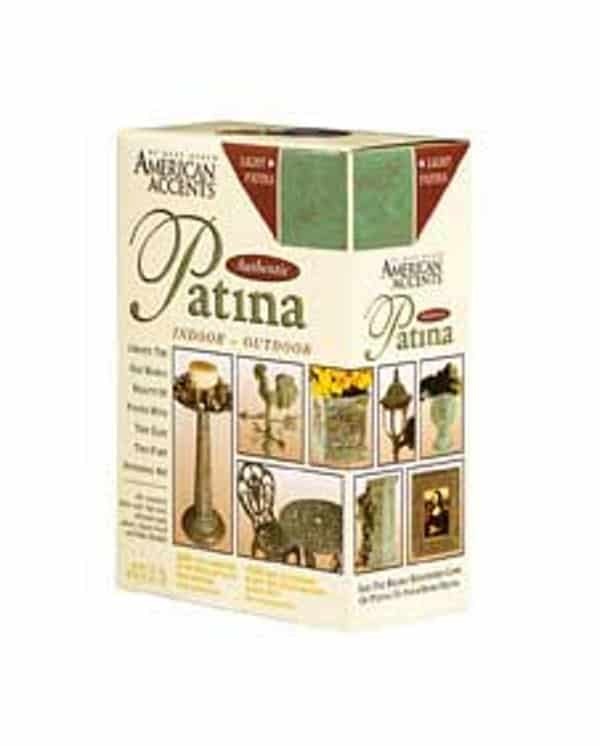 This particular one is by Rust-Oleum American Accents and is called Authentic Patina Indoor-Outdoor Kit in the Dark Patina color. This kit contains everything you need – base coat, top coat, abrasive pad, gloves, foam brush and idea booklet. My first challenge was getting the chandelier down from the ceiling. If I had to, I would have figured out how to do it and would have done it. However, since I have an electrician for a husband, I thought it would save time if I just asked him. He was happy to oblige. 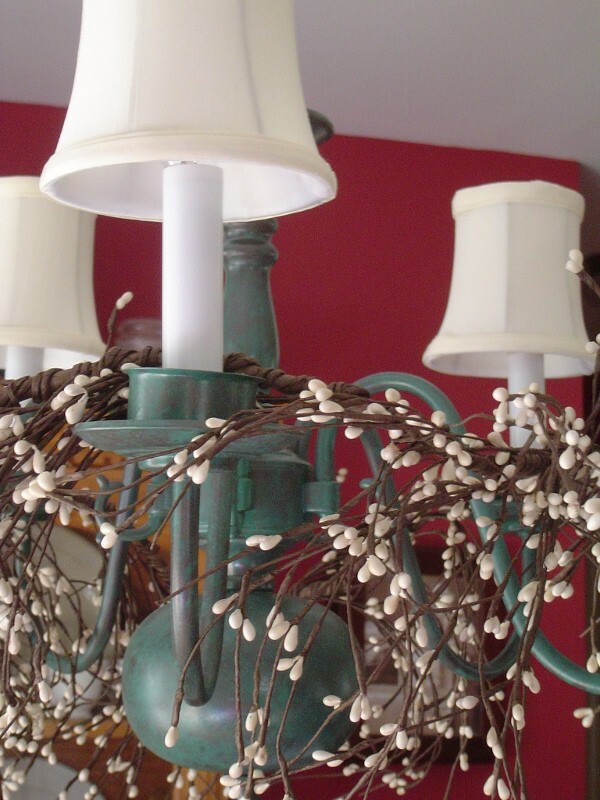 He hung the chandelier from a thick wire in the ‘shop’ area of our basement so that I could do my magic on it. The steps are listed on the back of the kit box. Step 1 was to spray on the metallic base coat and let it dry. Then gently rub the base coat with the abrasive pad. Step 2 was to use the sponge to apply the patina top coat. Step 3 was to immediately use a damp paper towel to dab the patina paint to give it the exact look I wanted. And that was it! I was so proud of my creation but it didn’t feel complete. I felt as if it needed something else. Then it came to me. It needed little mini lamp shades to complete the shabby chic look. I found a great selection on Ebay under mini lamp shades. Or you can find them here on Amazon: Mini Lamp Shades. And here, my friends is the completed look. My husband of course re-hung it. 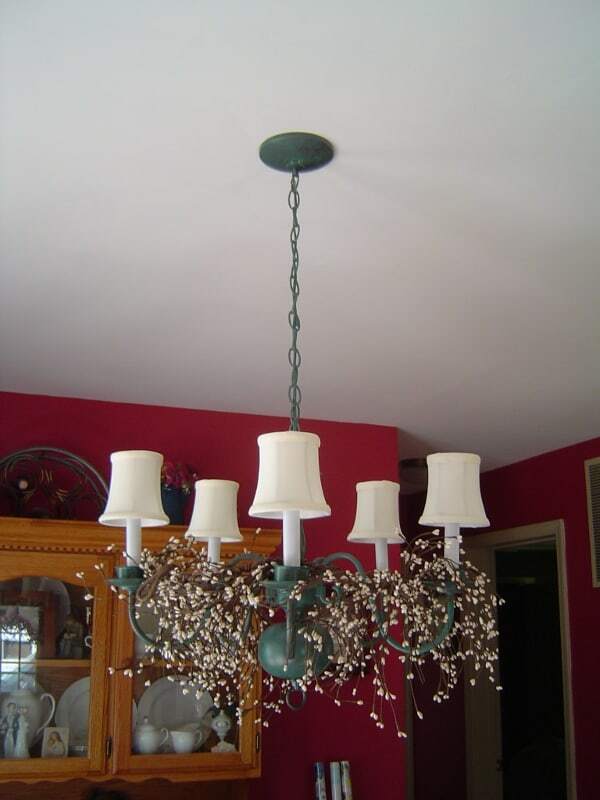 It was around the fall during the time that I refinished this chandelier. So I bought some grapevine garland with the little fake berries on it from the craft store and wrapped it around the chandelier. During other times of the year and certain holidays, I’ll wrap other things such as fall leaf garland, spring flower garland or I’ll leave it as-is and not wrap anything around it. Fast-forward over 7 years later and I’m still very happy with my little chandelier project. I feel that it fits our home decor so much better than the original brass look that it originally had. So if you’re a little fearful of tackling a new project, like I was, just go for it. What do you have to lose? The more you do these types of things, the more confident you’ll become. And it’s so rewarding to see the final product and to be able to say that you did it! So funny we both did this 7 years ago. And I bet you still love yours as much today as you did then. Thanks so much for your sweet comment. You made it so unique; I can’t believe it’s the same chandelier???? I love it!! Thank you Cheryl! It’s fun to see what you can do with something that’s simple and turn it into something totally different.